Hitzville Las Vegas is a stellar concert that highlights the beautiful sounds of Motown music of the 1960s-1980s. This 75-minute stage extravaganza brings many of the sacred sounds of Motown that made the city of Detroit the music capital of the world. Hitzville: The Show is performing at the intimate V Theater within the Miracle Mile shops located at Planet Hollywood Hotel and Casino. The stage show is highly acclaimed for the feel good Motown attitude that the performers transcend upon the audience. Jin Jin Reeves is the consummate performer being able to switch gears from being Diana Ross to Tina Turner. Jin Jin’s soulful voice is perfect for the songs that range from What’s Love Got To Do With It to My Guy to Ain’t No Mountain High Enough. At times during the show Jin Jin is so realistic that guests might think they are actually listening and watching Diana Ross or Mary Wells. Hitzville: The Show is produced by Jin Jin with the help of music director Scott Cannady and every portion of the stage show is a treat for the guests. The choreography is gorgeous with a wardrobe that features elegant flowing gowns that sparkle with the changing stage lights and the multimedia effects. The back-up singers are spot on in dress and adding melody to the many songs that will make guests smile. The six piece band that accompanies the artists on stage is right on beat throughout their performance. These accomplished musicians will have guests grooving in their chairs and singing. 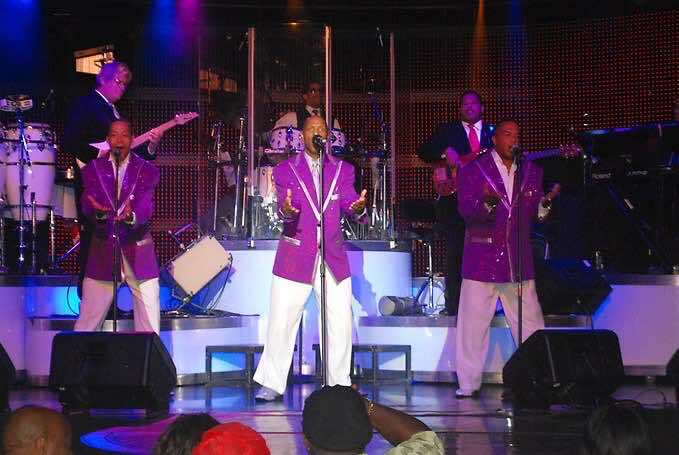 The stage show features many facets of Motown music and guests are sure to be pleased with renditions of such groups as the Temptations, The Four Tops and Stevie Wonder. The male tribute groups have wardrobes that match in color and the artists are dressed to the hilt. The show is filled with synchronized dance steps that flow with heart felt music by the dancers and singers. The artists are masterful in their vocals on such hits as Papa Was a Rolling Stone to I Heard It Through the Grapevine to I Want You Back hitting every note as the original artist intended. The amphitheater atmosphere at the V Theater is packed with appropriate props during Hitzville: The Show Las Vegas and the stat-of-the-art sound system as well as expert lighting effects enhances the production. Hitzville: The Show has all right elements of a top notch musical evening when patrons are looking to have their mood lifted in a musical and spiritual way. The magic of Motown that is created by Jin Jin Reeves while on stage is a tribute to her background and training. Jin Jin started early in life as an entertainer while growing up in Detroit, Michigan. The rise of Motown during this period of her life influenced her decisions on whether to be an actress, dancer or singer. Choosing dancing, singing and song writing as her passions, Jin Jin was noticed almost immediately by such a greats as Martha Reeves, Gladys Knight and Stevie Wonder. Soon after Jin Jin would turn her attention to acting and would accept a Diana Washington scholarship to the famed Julliard School of Performing Arts. Jin Jin’s performance in Hitzville: The Show is truly a culmination of her love for Motown-style music and her childhood dreams of performing on the biggest entertainment city in the world. Hitzville: The Show is currently performing at the V Theater located within the Miracle Shops at the Planet Hollywood Hotel and Casino. This venue holds up to 300 people in a comfortable setting with great sight views and an outstanding sound system. Open to all-ages this stage show runs Monday through Saturday at 5:30 P.M. Hitzville Tickets range from general admission to a VIP experience.